Niger's military rulers have suggested that only those with a university degree should be allowed to run in presidential elections. Candidates would also have to be under 70 years old. The reforms have been proposed by the Consultative Council, set up by the military after it overthrew ex-President Mamadou Tandja in February. Opposition groups have criticised the proposal, saying it excludes much of the population which is illiterate. "This is pure discrimination because only 20% of Niger's people know how to read and write in French," said former MP Sabo Saidu. The council said making it obligatory for presidential candidates to have a university degree would help bring Niger into the world of international business and aid development in one of the poorest countries on the planet. "Changes always have their advantages and set backs. 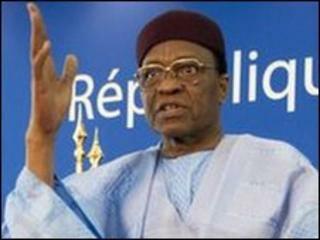 But in this specific case, Niger must endeavour to draft progress," the council's spokesman Colonel Ibrahim Yacoub told the BBC. Other proposed changes include making it compulsory for parliamentary candidates to have some level of secondary education. Although the reforms have yet to become law, correspondents say there is little chance that they will be blocked as there is no parliament to oppose them. The junta has promised to revert to civilian rule before the first anniversary of its takeover and stipulated that military personnel are not allowed to stand for election. Mr Tandja, a former army officer in his early 70s, was first elected in 1999 and was returned to power in an election in 2004. He came under increasing criticism both at home and abroad after changing the constitution to allow him to stay in power for a third term.